I’ve let it be known that I’m a Steelers fan. Getting that snippet of information out of the way was important so that, while you read my columns, you know there may be a slight subconscious Steelers’ bias. I really don’t believe I favor the black and gold in my fantasy analysis though. You can take a look back at a lot of what I’ve written and see that I told you to stay away from Mike Wallace, and that Ben Roethlisberger has historically been a pretty mediocre fantasy play. Of the things Steeler-related, the one thing that I think I can bring is additional information that not all fantasy bloggers will push forth. And it’s not their fault, it’s simply based on research and fandom. For instance, I had Jonathan Dwyer as a deep sleeper back in July, but part of the reason for it was that I knew Isaac Redman was unbelievably overvalued at his 5th and 6th round ADP. Redman historically had played in games when defenses were tired, and he rarely showed signs of being anything better than a mediocre back. It’s those occasions where I can help, and where my fandom comes in handy. If it’s about the Vikings, then I won’t pretend to know more than a true Vikings fan. I mean, I understand football and watch as much as I possibly can. I look at stats and I dissect footage. But I don’t know everything about the NFL, so why should I pretend to? All that will do is lead you to fantasy misery. So given this, here are some things I took away from Week 7 in the NFL – including analysis on the Steelers. Antonio Brown needs to get into the end zone. I really thought Brown’s numbers last year and his lack of touchdown receptions were somewhat statistically insignificant. When he has that many targets, and that many yards, it seems unreasonable to think he won’t score. But we’re seeing it again this year. Antonio Brown is easily Ben’s favorite target, and after Mike Wallace’s butter-finger night, we should all feel confident that Antonio Brown will continue to see looks. But he can’t get into the end zone, giving him a lot less value in non-PPR leagues. Is Darren McFadden a bust? I’ve had at least six people on Twitter tell me “Darren McFadden has been a bust.” And while he’s not putting up the kind of numbers almost everyone expected a healthy version of him to, he’s still not doing that bad. Let’s dive into this statistically. Over McFadden’s first five games, he’s posted an average of 10 points per game. That’s good for the 18th best average at the position. And it’s important to note that he hasn’t “blown up” necessarily in any of these games. His best game came against Pittsburgh, where he had a 64-yard touchdown. This week, McFadden finished with 53 yards on the ground and 28 receiving for a total of 8.1 fantasy points. His average points scored per game will now be 9.67 after this week is over. To put this into perspective, LeSean McCoy, the consensus top-3 choice, is at 11.7 points per game. Darren McFadden’s yard per carry average is awful. And his Raiders’ team is pretty bad too. But to call him a bust right now is far too premature, especially when you consider the matchups he’s faced. Sure, he had Jacksonville this week, but it was also a Jacksonville team off a bye. Look at his upcoming schedule: Kansas City, Tampa Bay, Baltimore, New Orleans, Cincinnati, Cleveland. He is, plain and simple, the best player in fantasy football. He’s scored two touchdowns in 3 of his 7 games, and has been held touchdown-less just once. Arian Foster is unbelievable, and I just have to give a shout out to him here because it blows my mind. My roller coaster relationship with Chris Johnson continues. After Week 3, I apologized to the fantasy world for telling you to draft him in the first round. Now, after three of his last four weeks resulting in double-digit fantasy performances, I feel like I may have reacted too quickly. At the same time, I feel like I reacted correctly. I can’t figure out CJ. I would say that he’s just exposing poor defenses, but he did go for 141 against the Texans. The issue, as it’s always been, seems to be between the ears. If Johnson can be decisive, quick dancing around and move towards the end zone, he’ll be back to his old form. I just don’t know if he can do that. If you’re getting some decent offers for Johnson, go ahead and take them. I think right now he should be viewed as a low-end RB2 given his inconsistency. Rodgers and Brees make their case for early-round quarterbacks. If you drafted one of these guys, your team could be in great shape right now. You could’ve potentially gotten Jamaal Charles in the late second and AJ Green in the third. Then, in the fourth, you may have selected Reggie Bush. Boom. The fact is, from a value standpoint, Brees and Rodgers are still not living up to their pre-season expectations. “But how?” you ask. When people analyze players and positions in fantasy football, they fail to find the relative impact a chosen player makes to the rest of their team. For instance, you may be winning at quarterback because you selected Aaron Rodgers, but the probability than you’re winning at running back receiver are much lower than a team who selected a quarterback in the later rounds. Why? Because you’ve forgone the opportunity at top running backs like Ray Rice, Arian Foster, Adrian Peterson, Marshawn Lynch and LeSean McCoy. You can give examples as to how a lineup could be successful with an early, first round quarterback. But I can give you examples as to why that could fail, or why getting a late one works. And the fact is, at the end of the season, I’ll be able to prove – mathematically – why getting one late is a better idea. If you can’t wait, just read my book now. And people also fail to remember that there is an inherent inconsistency with running backs and receivers. They’re not touching the ball every down. 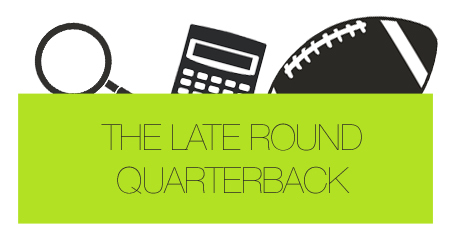 Quarterbacks are, which is why almost every starter scores double-digit points every week. Keep the concept of value in mind before you begin to crown these two unbelievable quarterbacks as fantasy must-haves. Remember, I’ve always said that Aaron Rodgers is valuable. I had him as my 11th best overall player this year because that’s what value told me. (It spoke to me, the word “value”). Randall Cobb is now an every week starter. Even when Greg Jennings comes back and is healthy, I like Randall Cobb each week from here on out. Being a slot receiver, the only impact that Jennings will make is a potential couple of lost targets per week. But, at the same time, Jennings’ ability to draw more coverage may open things up even more for Cobb. The Arizona running back situation is annoying. How many people started William Powell this week? According to ESPN, not a whole lot, but there were some. His bad matchup forced me to place him in the “take a seat” category in my weekly start/sit column, but I at least expected him to get the bulk of the carries against Minnesota. LaRod Stephens-Howling became the man for Arizona this week. My advice? If you own Stephens-Howling, trade him. If you own Powell, stash him on your bench. Josh Gordon is the guy in Cleveland. Another “really neat” player I had this week was Josh Gordon, and he didn’t disappoint. He’s the perfect play in non PPR leagues, as he continuously is targeted for big plays. The issue with Gordon is his consistency – can he really keep this up? Regardless, Gordon is easily the wide receiver to own in Cleveland. Greg Little may be a bye week fill-in for deeper leagues, but he should rarely be in someone’s lineup. What do you do with Cam Newton? Here’s the deal with Cam. You spent an early draft pick on him, and now he’s replaceable with nearly anyone in free agency. Do you trade him? Do you bench him? Now, I clearly don’t own Cam in any leagues because, regardless of him being an early-round quarterback or not, I felt he couldn’t reproduce last year’s numbers. But if I did, I’d be holding on to him. Let’s say you decide to trade Cam. What are you getting in return? Probably a quarterback who wasn’t ranked high in the pre-season, and is playing fairly well. Like Ben Roethlisberger. Or maybe you’re getting a middle-of-the-road wideout with a risky, inconsistent quarterback like Joe Flacco. Who cares? Keep the potential upside with Cam. Make sure to get a backup quarterback that you can play matchups with him, though. Alfred Morris is Mr. Consistent. My worry with Alfie is that he’s a rookie. Are his tires going to fall off? As of now, there are few signs, so keep riding him. But just keep it in mind as you move into the later weeks of the NFL season. The Bengals have a rough road ahead. I can’t say I didn’t warn you. Andy Dalton’s numbers have been so favorable because, this season, the Bengals have already played the Browns twice, the Redskins and the Jaguars. And BenJarvus Green-Ellis? After taking flak for my pre-season article, it looks as though my haters have gone silent. When Green-Ellis doesn’t get into the end zone, he’s been next to worthless. He clearly benefited from a consistent offense in New England, allowing him to find more holes against honest defenses in the red zone. Green-Ellis has scored over 10 fantasy points once this season, and it came during Week 1 against Baltimore. The only Bengal I’d feel confident with moving forward is AJ Green. With their schedule becoming tougher, they’ll surely have to rely heavily on their best offensive weapon. And, of course, AJ Green is an absolute monster. Brandon Lloyd likes targets but hates touchdowns. Brandon Lloyd is 8th in the league in targets, but he’s only put up double-digit fantasy weeks twice this season. Oh, and he’s only scored once. He’s the Antonio Brown of the Patriots offense, and unfortunately, he’s falling victim to Tom Brady having an overload of weapons at tight end and receiver. What to do? Well, similar to a lot of these players on this list, you’ve got to hold onto him. He’s got the talent to be a top receiver, and with Brady, it’s capable of happening. It’s not worth getting someone mediocre in return for him.